Roy Hodgson revealed Sam Allardyce has never apologised to him for mocking the way he speaks - and says it is too late now. Allardyce was filmed referring to Hodgson as "Woy" during the meeting with undercover reporters posing as businessmen which brought an abrupt end to his spell as England manager in 2016. Hodgson, Allardyce's predecessor as Three Lions boss, will come up against the now-Everton manager for the first time since that episode when he takes his Crystal Palace side to Goodison Park on Saturday. The 70-year-old Eagles chief, who says he will still shake Allardyce's hand, admits their relationship has been soured as a result. 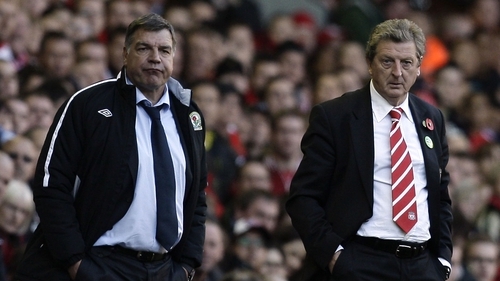 Asked if Allardyce had apologised, Hodgson replied: "No." He added: "Do you like being insulted? No, not particularly. Did it bother me? I didn't lose any sleep over it. "My relationship with him before, I always thought was good. Now I would expect it to be less good. "Would I like him to apologise? No. It's far too late. It has gone. It belongs to the distant past. "In jobs like I am doing at the moment when you are the manager of a Premier League club, you live very much in the ultimate present and the future. I'm not interested. I've said what I've got to say." Hodgson could pile on the misery for Allardyce, whose side were thumped 5-1 at Arsenal in their last outing, with a victory which would ease their relegation fears and keep Everton in the mix.